You'll be £14.99 closer to your next £10.00 credit when you purchase SS Totenkopf at War. What's this? The SS Totenkopf (Death Head) Division even 70 years on retains its formidable and ruthless reputation as a superbly efficient yet murderous formation. It earned this for its actions throughout the Second World War, first in 1940 during the blitzkrieg in Northern France and then on the Eastern Front. The battles at Kharkov and Kurst saw some of the fiercest fighting of that long and terrible campaign. During the long retreat back to the Fatherland the Division fought with customary dogged determination, nay fanaticism. This superbly illustrated work, drawing on images taken by participants, portrays the SS Totenkopf's history from formation through training to the battles in northern France and in Russia. This new addition to the very popular Images of War series follows the established pattern of concise text, captions, extended captions and lavish illustration. Most books in this series use largely images from official archives. 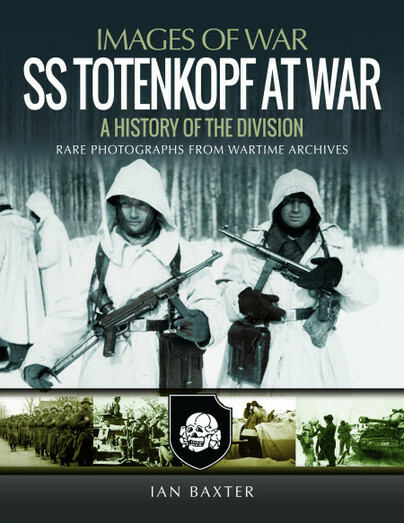 In this new book many images come from private albums of members of the Division – Very Highly Recommended.